These poignant and uplifting tales describe how Peggy Rodman, a wife and mother, uses a new found gift to help lost and confused spirits make sense of their past and reunite with their loved ones. At the same time Peggy finds some comfort from her own grief at the death of her dear mother. Although both tales brought tears to my eyes, they both ended on a positive note and I found them to be inspirational and uplifting reads in their examination of love, loss and reconciliation in this life and the afterlife. In Echoes from the Past – Part 1 – Harry, we are introduced to Peggy, the heroine. Peggy has recently moved into a cottage with her husband and two boys. In the run up to the move Peggy’s mother was taken ill and died. Peggy is struggling to come to terms with her grief, whilst helping to support others such as her dad, who lives nearby and her two boys who have started a new school. Three months after the move, whilst exploring the area around her new home, she discovers a secret place where she meets a young man called Harry, who she realises lived over a century ago. Peggy recognises that she has developed a rather extraordinary gift – the ability to interact with spirits of the departed. Harry’s memories of his life are confused and he has become tied to this earthly plane. Peggy helps him to remember and find peace at long last, moving on to be reunited with his loved ones. At the same time Harry’s actions encourage Peggy to find her own peace and start to come to terms with her mother’s passing. The character of Peggy, a wife and mother, with hopes and fears we are all familiar with, is one which is easy to empathise with. Peggy is a gentle and thoughtful person, who is very much in tune with her environment and takes pleasure in engaging her senses. She is happy and secure in her relationship with Ed, her husband, and adores her two school age boys. However, she is in a dark place, deeply grieving for her mum, and her ability to communicate with those spirits who remain tied to this world is new to her. Harry is a lovable character. He is confused and is shocked when Peggy helps him to realise that he is in fact dead and recognises that Peggy is from a time that is not his own. At first he cannot recall much of his life and feels desperately sad. However, with Peggy’s help he is encouraged to make sense of his flashbacks to his past life and eventually his death, enabling him to reunite with his family in the afterlife where he can find happiness again. Both Peggy and Harry comprehend that something extraordinary is happening and that they have been brought together for a reason. They have a strong physical and emotional connection, which neither understands. I enjoyed the fact that for a ghost, Harry appears very corporeal indeed, like a living breathing person. Indeed, there is reference to Peggy feeling his breath on her cheek, as well as being the recipient of his touch, hugs and kisses. Peggy feels guilty about the attraction she feels for Harry and Harry also feels guilt for he knows that he was happy with his wife and children when he was alive. Their shared experience of grief enables them to gain comfort from each other. The story has some mystical, almost fairy tale qualities, especially in how the author describes Peggy’s secret place. I particularly enjoyed the presence of the dove throughout the tale, which I read as a symbol of love and peace and representing a link to the afterlife. For the most part the author’s writing style flowed readily and quickly drew me into the plot and the characters. I would have liked to know a little more about Peggy’s relationship with her husband Ed, which seems very close and loving and hope that this will be explored further in subsequent instalments. I am also curious about Peggy and Harry’s special attraction to one another and wonder if we will be seeing any more of Harry as Peggy’s story unfolds. I found the tale a very thoughtful and touching read in how it explored the deep emotions connected to death, grief and the afterlife. I liked the way that the story concluded and found it to be an inspirational read. In Echoes from the Past – Part 2 – Eloise, Peggy is getting her life back on track after her mother’s death, whilst becoming reconciled to the responsibilities of her special ability. Her joy of life is returning and, at her husband’s suggestion, she applies for a job in Gloucester. It is there, after attending her interview, that she encounters the troubled spirit of Eloise, who has outstanding issues to resolve before she can pass over peacefully. Peggy is more than happy to assist, especially when she hears her heartbreaking tale. Once again Peggy uses resources available at the local records office to identify some truths previously unknown to Eloise. She also helps Eloise to remember what happened, helping her to reconcile the past and to reunite with her loved one. Eloise is a fascinating character, who lived in the late 1800’s. We learn that she was well educated and wanted to contribute to society through working in an area often reserved solely for men. Unusual for a woman of her time, she was able to find work in the offices of the local match factory. Her story focuses on a romance between her and a young man called Charles. Her unfinished business concerns events and misunderstandings which arise soon after she weds him – I will not reveal any more than that as it would spoil the plot for those wishing to read the series. In this instalment, Peggy grows in confidence and relishes the fact that she can offer help to the troubled spirits she seems to draw to her. We also learn more about her husband Ed and Peggy’s relationship with him. Eloise’s experiences of struggling to justify her role in the workplace as a woman in late Victorian Britain were interesting to reflect on. Peggy comes to realise how lucky she is to have the freedom to work and be a a wife and mother without society judging her harshly. I found the issues raised to be very thought provoking and the conclusion of the tale an uplifting one. As with Harry’s story, I could sense that the author had carried out a lot of local research into the time and places that her characters inhabited. This added to my reading experience and added depth to the characters and the narrative. Once again the tale was an emotional one and I welcomed the fact that Peggy was able to help Eloise find peace at last. The two instalments flow almost seamlessly into one another and should be read in order. I am looking forward to the next instalment of Peggy’s story, The Lost Children and the fourth and final instalment which is planned. I recommend the Peggy Rodman Series to those who like to read about the paranormal and explore, in a sensitive way, the issues connected with grief and loss and the veil between the world of the living and those departed. To read author Sarah Colliver’s post, in which she talks about her inspiration behind the Peggy Rodman Series, click here. A Very Unwelcome Visitation Indeed! I have been addicted to author Paul Hodge’s blog Freaky Folk Tales, where he posts his research into folklore and his short stories, for some time now. The site also features Paul’s awesome and atmospheric photographs and a collection of illustrations which he has put together whilst traversing this realm and researching his tales. These form part of his own collected works, Freaky Folk Tales. One of Paul’s stories, A Tale of Chirbury has been published in ‘Darker Times Anthology, Vol 3′ – available on Amazon Kindle and Paperback (click on the link to find out more). I had overheard conversation on the topic but felt unable to examine the rumours from any rational point of view. Although it would amount to nothing elaborate, I had posited that the time required to conduct an investigation would be entirely wasted as, ultimately, the villain would soon be unmasked; more so, all my instincts pointed to the revelation of a scoundrel no more than a child or simple-minded adult (perhaps more than one) intent on concocting reckless mischief out of sheer devilment. My mother indicated that she would rise to answer the door, but I insisted that she should remain at rest and I should attend to the caller; though I was at a complete loss as to whom would be visiting at such an inconvenient time. When I opened the door, I was surprised to see Mrs Bentley’s son and immediately I took note of his rather confused and distressed state. Holding his chest, he managed to find his voice and told me that I should come quickly to the house. Inside, upon the kitchen floor, I found Mrs Bentley, lying in a most unusual position, as if she had fallen backwards although, somehow, her arms had remained directly by her sides. With all the finesse of a well read scholar I set about searching for signs of life upon the unfortunate woman’s body. But there was little I could do, as I soon became aware of a great coldness that had set into her. I recall having seen only one deceased person in my life, and I can assure you that I felt decidedly queasy despite deference in the duties I had in assisting her poor son. A doctor was duly dispatched to the house and thereupon confirmation came that Mrs Bentley had suffered heart failure. It was a shocking circumstance despite Mrs Bentley’s advancing years; and on such a day too! It was only through this close-hand hospitality did Thomas reveal a curious happening but an hour or so before his mother’s death. He had been seated in the drawing room, reading a newspaper, when a sudden, awful shriek had attracted his attention. It appeared to come from the kitchen. 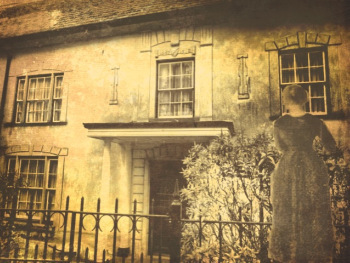 Knowing the room to be solely inhabited at this time of day by his mother, he ran through the house and in that particular room he had found Mrs Bentley staring at the window, her hand over her mouth, breathing with such pronounced irregularity. After Thomas had helped her in taking a seat and some refreshment, she told him the source of her distress. Whilst examining the condition of the hedge from the kitchen window, she noticed a woman standing beside the garden gate. Not expecting visitors she wondered who it could be. Most certainly not her sister or a regular caller. For a time, she puzzled over this black-dressed stranger who stood as still as a statue outside her cottage. Finally, with the unpleasant looking woman having remained there for as long as she could take, Mrs Bentley ventured outside to confront her; but on so doing, the woman had disappeared into thin air. And the most awful of sights; returning to the kitchen, she had taken another look out through the window and there, to her utter disbelief, she had come upon a vision that brought a chill to her bones, wracking her frame with a sickening tautness: from behind the hedge, she had seen the same woman rising up, up beyond the height limited by human form, reaching and stopping at her waist, her arms outstretching to draw a shadow upon the hedgerow top; and with lips still, her eyes bore straight at her with such intensity, before disappearing once more. I must say that I had been quite affected by the tale; it remained with me for a considerable time in undiminished intensity. As I stated earlier, I had taken some comfort in considering it to be the result of inconsiderate japery from youths; concluding in such darker an end that they did not dream to imagine. But despite this, I was to consider from time to time that it was, perhaps, something else. My mother and I have now returned from church; the day a far improved version of that two years before. And even though through anniversary alone my mind does dwell on such troubles of the past, I have found the day to be one of joy, especially to have seen her in such fine fettle. And such command of her stick too; it had come to her aid several times throughout the service and she had administered its alleviating qualities with considerable deftness. More so, with the sun behind us, and a spread of warm radiance on our backs, her steps have been more robust and steadfast than for as long as I could remember. I am back in the house now, having just prepared tea. On the table beside the fire I have placed our favourite biscuits. On the air, a little early blossom that I was want to bring into the house before we left for church. And now, with the clock not long past three, I settle down, dragging the newspaper onto my lap. The comforting glow of the fire soothes the eyes and undoubtedly, before long, I shall be assuaged into sleep, the paper falling to my feet. As I listen towards the kitchen, with my eyelids struggling not to surrender to the seductive comforts of the fire, I hear the sound of plates: surely a little Simnel cake to add to the occasion? But possibly more plates than one or two hands could adequately grasp. No matter, I will go to her aid as surely her womanly stubbornness will prevent her from seeking help in this direction. As for the shriek; mother gets so awfully upset when she drops things. For too long we have told and retold colourful stories from overseas whilst neglecting the rich vein of tales that were distilled on these shores; the tales that once lived a lively existence on the lips of our forebears. Our ancestors would be amazed at our advances, but would they not equally be astonished by how we seek our greatest thrills from wires and circuitry, an electronic buzz that distances ourselves from what it is like to step into the half-light, listen to the words of a stranger and be enthralled – and possibly a little scared – by the actions of our fellow man? Maybe then it is time to look a little inward and re-evaluate our indigenous worth as a treasure trove of chronicles that revel in everything from the magic of dragons to the terror of a curse. If you agree, then it is then time to bid you a warm welcome – a welcome to the world of Freaky Folk Tales. PJ Hodge left London and came to reside in Hampshire armed with the collected works of MR James, Kate Bush and Nigel Kneale. He now trawls the dusky corners of the country researching folklore and writing short stories about shadows, shades and spectres. These form part of his own collected works, Freaky Folk Tales.